To be an informed consumer of dog food, one must know a little about what constitutes good nutrition. I will try to touch on basic important concepts while avoiding the more complicated chemistry that goes into the process. A short course in small dog nutrition 101 would not be complete without a couple of definitions. Nutrients are substances that are provided in the diet that are needed for growth and metabolism. There are six basic nutrients that dogs require. Dogs need a balanced diet that consists of water, proteins, fats, carbohydrates, vitamins, minerals, to keep their bodies in top shape and healthy. We can also classify nutrients as either being essential or nonessential depending on whether the body make its own or has to ingest it through the diet. Essential nutrients are those that must be included in the diet. Nonessential nutrients are manufactured by the dog's body, but can also be provided for in the diet. 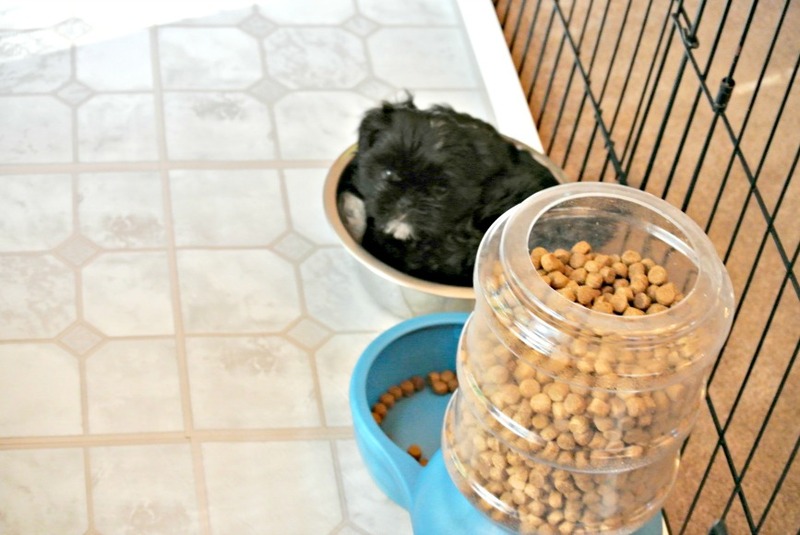 A small Shih Tzu puppy has found a good place to sleep in his food dish. There seems to be some controversy over dog nutrition in recent years. Some people feel that dogs are carnivores and need only eat meats where others feel that dogs are omnivores and should eat a wide range of foods including meat, vegetables, fruits and grains. The omnivore theory dates back to dogs in the wild. Early dogs would eat the entire carcass of an animal including the stomach contents, organs, skin and meat, providing them with a wide variety of nutrients. Dogs would hunt, then eat their prey. They were also scavengers, eating what was available to them. So, here is your quick course in Small Dog Nutrition 101. Puppies need water for hydration just like people. All dogs need specific nutrients in a well-balanced diet. Water is the most abundant with proteins next on the list. Water can be provided in a bowl or through a bottle. Some people prefer to serve filtered or distilled water rather than tap water. Proteins are needed to grow bones, muscles, nerves and all the other living tissue found in the body. Proteins make up most of the body's structures such as hair, skin, tendons, cartilage. Hormones and antibodies are made up of proteins. Proteins are made up of amino acids, twenty-two total. The dog's body can produce 12 of them, but the other ten must come from the diet (essential amino-acids). Dogs need a daily dose of proteins to sustain their bodies. Protein stores in the body are ever changing--cells and tissues wear out and must be replaced. If the dog ingests more protein than what is needed, the excess is used as an energy sources or converted to fats and stored in the body. Protein in the diet comes from either animal or plant sources. There are a wide variety of animal sources used in dog foods these days with the most common ones being chicken, beef, lamb, fish or pork. Some expensive foods also contain more exotic forms such as bison, duck, venison or ostrich. Proteins from plant sources include corn, soybean, peas and potatoes. ogs are considered to be omnivores meaning that they eat both meat and plants. They do not do well on a vegetarian or vegan diet. Carbohydrates include all the simple sugars and starches found in food and are in the diet primarily as an energy source. Some carbohydrates are necessary, but are controversial and often misunderstood. How much starch and which starch sources are used is a matter of much debate. A wide range of carbohydrate sources are used in dog foods including corn, rice, wheat, oats, and potatoes. Vegetables and fruits are added in some foods, but usually not to the extent that the other sources are included. Dietary fiber is also part of the carbohydrate group and includes those parts of the plant that are poorly digested by the body. Since they are not well digested, dogs do not receive much in the way of energy or nutrients. They are important because the provide dietary bulk that creates that feeling of being full and they also help maintain gastrointestinal functions. Also, fermentable fibers have an important role in maintaining the normal microbial populations in the intestines. Both types of fibers are considered important. Look for dry foods that contain between three and seven percent crude fiber on the guaranteed analysis chart. Fats provide the body with energy and add to the flavoring of the food. Fats vary in nutritional value with both the omega-3 and omega-6 fatty acids being high on the list. They are considered essential fatty acids because the body cannot synthesize them. The must be obtained through the diet. Better foods will provide them in a higher quantity such as 2.2% Omega-6 to 0.3% Omega-3. Minerals are made up of inorganic elements that are needed for growth, development and maintenance of the body. Some are needed in larger quantities (macro-minerals). Examples of these include calcium, phosphorous, magnesium, sulfur, sodium and potassium. Others are needed in very small quantities (trace-minerals). Cobalt, Iodine, Manganese and Selenium are examples of trace elements. 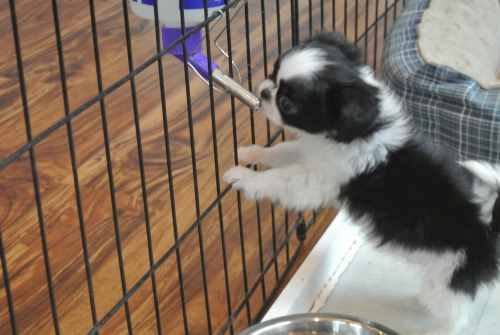 Small dogs grow faster than large breed dogs reaching maturity at a younger age, usually long before their first birthday. Most Shih Tzu dogs reach their adult weights by the time they are 10 months. Reproductive maturity is often reached even earlier. They also have a faster metabolism compared to large breed dogs which means that small breed dogs have a higher caloric requirement per pound of body weight than their larger cousins. It also means that more protein and fats in the diet are important for optimal health. Small dogs also have smaller stomachs so less space to hold large meals. Since they need to consume large qualities in relation to their body weight, they require small meals, several times a day. Puppies especially do better on 3 meals a day until they are 6 months old. If small dogs do not eat on a regular basis, they can be prone to blood sugar drops that result in hypoglycemia. Small dog breed dogs do better with smaller sized pieces of kibble. Many commercial dog food companies now offer specific foods for the size of the dog and some even offer breed specific foods. So, what is the best food for small breed dogs? Everyone has their own opinions. Shih Tzu have long dense double coats. Many also have sensitive skin. One sure sign of a healthy Shih Tzu is the condition of the coat. 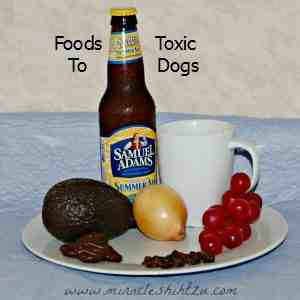 Foods for Shih Tzu dogs should promote healthy skin and hair. 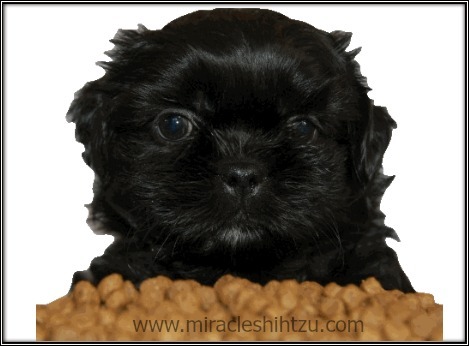 If you plan to offer a commercial dog food, it is best to find a company that understands the unique digestive requirements of Shih Tzu dogs. There are some companies that make dog food that is breed specific. Just because they may be specific does not make them a good food. Stray away from those that claim to have a small breed brand simply because it comes in small pieces. The size of the kibble is obviously a factor in how easily the dog can eat it, but it should also contain other things as well. If ever in doubt about deciding on a commercial dog food, the best advice that you can take away from this site is to become an informed consumer. Learn how to read dog food labels and seek the advice of professionals.